This exhibition shows photographs taken on an expedition of Swiss explorer and meteorologist Alfred de Quervain to the Uummannaq fjord and ice cap in Greenland. The photographs are partnered with images and instruments from this year’s expedition to Uummannaq by researchers from the RESPONDER team. The exhibition features an interwoven display of historical photographs and related examples from modern science. We are still active in the region, thanks to the ongoing support of the local community, and continue to study the glaciers that surround Uummannaq. 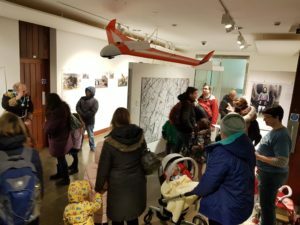 As part of the exhibit opening, the RESPONDER team welcomed twenty children and staff from Children’s Home in Uummannaq to Cambridge to attend the opening of the exhibition. The talented group gave traditional dance and drum performances and presented new songs written and performed by themselves. It was an altogether-memorable evening in which members of the local community of Cambridge met with members of the local community in Uummannaq. The Children’s Home is an ongoing supporter of our research at Store Glacier, providing the research team with accommodation and community when we pass through Uummannaq on our summer field campaigns. 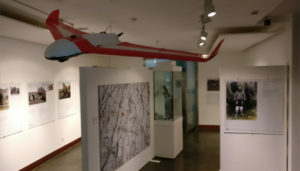 The exhibition was on display for 6 months, and we had lots of keen visitors asking interesting questions. Our work in Greenland was seen by 24,260 members of the public, who dropped by. We also had 100 school groups visiting the Museum while the exhibition was on display. We hope everyone left knowing just a bit more about Greenland and Uummannaq, and the work we are doing up there. It is after all one of our most treasured Arctic destinations.